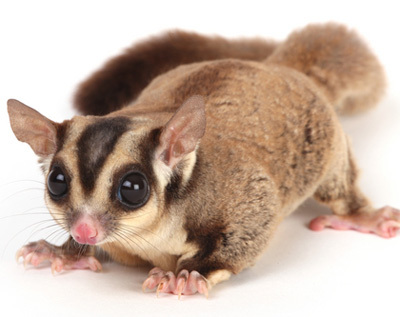 Sugar gliders are native to Australia, Tasmania, Indonesia and Papua-New Guinea. Their descriptive name comes from their love of sweet foods and a membrane that allows them to glide. Sugar gliders are marsupials which means that they raise their young in a pouch on the mother’s belly. They are small mammals and adults weigh between 4 and 5 ounces. A list of the supplies necessary to care for your pet sugar glider. Information on the proper diet and supplements required for your pet. A guide to the type of home needed to have a happy pet. Information on common health problems and illnesses that could affect your pet. All about sexing and breeding your sugar glider.